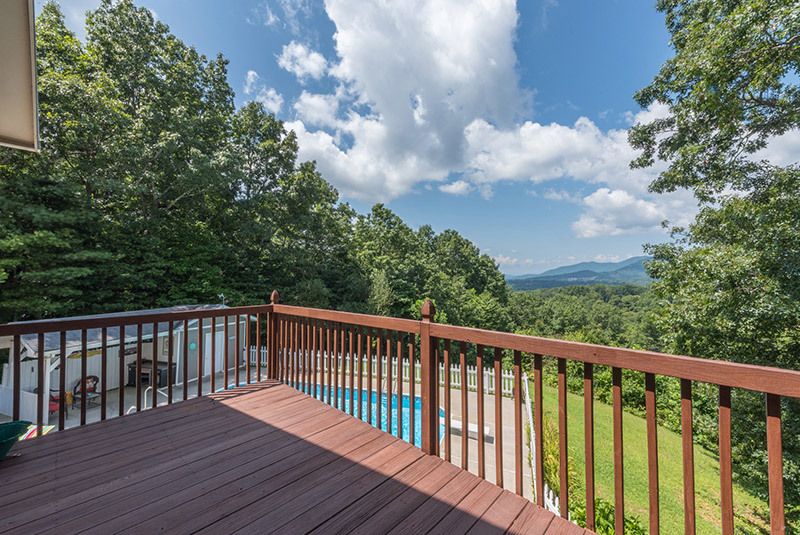 What if you could drive a short mile from Black Mountain and find a secluded mountain home with its own inground pool and a remarkable mountain view. Oh, and what if you could bring along your family and your dog! Mountain Top Oasis, a three-bedroom, 2.5 bath home welcomes guests to enjoy an outdoor pool seasonally and a hot tub year-round. With an expansive patio area, there’s ample outdoor room to relax and enjoy the magnificent view. With east and west facing views, guests can wake up with a coffee from the front porch rockers and unwind after an enjoyably rejuvenating day by watching the sun set. On the interior, the main floor has three bedrooms, and the open floor plan provides ample sitting space, including dining sitting for six. The second floor has a great family room area with board games, books and a television. Both levels have gas log fireplaces. And as mentioned previously, medium-sized well-behaved dogs are welcome. With its proximity to Black Mountain, this lovely home offers easy access to Black Mountain and Montreat hiking trails. In addition, Asheville amenities are an easy driving distance as well. Take a look at the various offerings from Greybeard’s Guest Services to get an idea of some of the possible special deals, including discounted passes for Biltmore Estate. And again, this special secluded Black Mountain rental home belongs to the listing of Greybeard’s dog-friendly rentals. For more assistance in finding the best western NC rental home for your family, please contact Greybeard Rentals.